The Resurrection of Jesus Christ, believed by roughly 2.4 billion people across the world, is the foundation of the world's largest religion. In the Biblical narrative, Jesus of Nazareth was crucified by Roman soldiers and buried in a sepulcher (tomb). Three days later Jesus miraculously rose from the dead to proclaim His divinity and declare the redemption of all mankind. The reality of this event is the cornerstone of all Christianity, without which Christianity would cease to exist. But could the Resurrection have been a hoax? 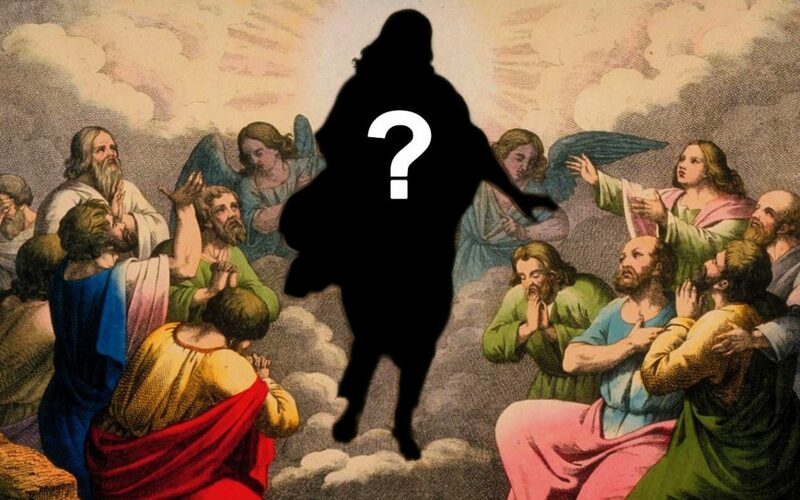 Is it possible that Jesus was not resurrected, but that his body was stolen in the night and hidden by his disciples to fake his resurrection? Unfortunately, there are no history books that can shed light on this subject - the only records of the Resurrection that exist are the four gospel accounts recorded in the gospels of Matthew, Mark, Luke, and John. Despite popular opinion, these gospels were not eyewitness accounts of the Resurrection. In fact, all four gospel accounts were written decades after Jesus' death by people who had never known Jesus and who relied on the sayings of others. As the author of Luke confessed, he was not a witness to the resurrection. Instead he "carefully investigated" the accounts that were "handed down" by Jesus' earliest disciples in order to write his own account to convince his readers to believe in Jesus. (Luke 1:1-4). In other words, the gospel accounts were not precise historical records so much as they were persuasive arguments in support of increasingly popular beliefs written by believers in order to codify the story and to address important problems facing the Christian community. The accounts set out to tell the story of Jesus: His life, mission, death, and resurrection, and why it mattered to new followers. In other words, if we compare them to modern standards, the gospels are more akin to apologetic propaganda than a historical record. With that in mind, by parsing through the distinctions between the gospel accounts, we get a rare glimpse into a little known, but very significant, perception of the first-century Christians. All four gospels agree that on the third day several women went to Jesus' tomb but found it empty. Interestingly, Jesus' resurrection was not their first assumption. Instead, they believed someone came during the night and took his body: "They have taken away my Lord, and I know not where they have laid him" (John 20:2, 13). In fact, John indicates that they were not even aware that Jesus was supposed to be resurrected: "For as yet they knew not the scripture, that he must rise again from the dead" (John 20:9). Eventually, in the accounts, Jesus appears to the disciples, confirms his resurrection, and they spread the word to the world. But, not everyone was convinced that Jesus was resurrected. Matthew states, "This saying is commonly reported among the Jews until this day…[that] His disciples came by night, and stole him [away] while we slept ..." (Matthew 28:13, 15). Matthew's account clearly acknowledges a belief among the people that Jesus' body was stolen by Jesus' own disciples. In fact, it appears that one of the fundamental purposes of Matthew's version of the resurrection was to quash the rumors of body-snatching by altering the story in such a way as to make the theft of Jesus' body impossible. The Gospel of Matthew starts its Resurrection account with a unique and peculiar conversation between Pilate and the chief priests. The priests first remind Pilate of Jesus' self-prophecy that He would rise from the dead. They then warn Pilate that Jesus' followers might steal his body and then tell the people that He was resurrected. Matthew employs a brilliant rhetorical device here by first informing the reader that Jesus prophesied his own resurrection, and then theatrically pitting Jesus against the corrupt and widely hated priests. The priests then suggest that Pilate place guards at Jesus' tomb to prevent people from stealing the body. Pilate agrees to provide soldiers to guard the tomb from thieves, but then goes a step further by ordering them to secure the tomb by "sealing" the stone, thereby ensuring that the body could not be removed (Matthew 27:62-66). These two details are not in the other gospel accounts. In fact, not only do Mark, Luke, and John exclude any mention of guards, but in those accounts when the women arrived at the tomb the stone was already rolled away. 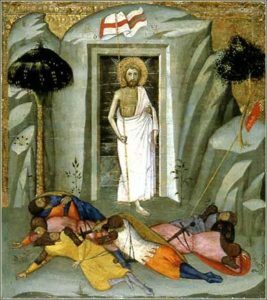 In fact, their first thought, echoing the concern of the priests, was not that Jesus arose from the dead, but rather that his body was stolen (John 20:2, 13). 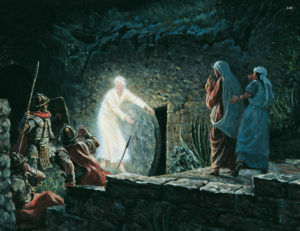 According to Matthew, on the morning of the Resurrection, two women went to the tomb but found it sealed and guarded. An angel then appeared, rolled back the stone blocking the door, and caused the soldiers to faint. Matthew wants the reader to believe, despite contradicting the other accounts, that there was no possible way Jesus' body could have been stolen precisely because the tomb was shut with a stone, sealed and guarded by soldiers. Again, these details are in stark contrast to Mark, Luke, and John where the stone had been removed before the women arrived and where the women believed someone had stolen Jesus' body. In contrast, the body-snatching accusation is addressed in Matthew, but rather than coming from the sympathetic female disciples it comes from the corrupt priests. In a story found exclusively in Matthew, the soldiers reported back to the priests and the priests then, in a Faustian demonstration of soul-damning corruption, paid the soldiers to lie! The priests instructed, “Tell the people that Jesus’ followers came during the night and stole the body while you were sleeping (Matthew 28:13). Matthew continued, "So the soldiers took the money and did as they were instructed [lied to the people]. And this story has been widely circulated among the Jews to this very day." (Matthew 28:15) Matthew's account gives us valuable insight into the cultural interpretation of Jesus' resurrection during the end of the first century. Matthew acknowledged that there was a widely circulated belief that Jesus was not resurrected, but that his body was stolen by unscrupulous devotees (of a deceiver). Matthew further asserted that the rumors originated with the corrupt chief priests. In other words, Matthew's story specifically counters the widely circulated rumors of body-snatching by first making it impossible for Jesus' body to have been stolen, and then alleging that the rumors were started by a group of corrupt priests who were already highly resented by the Jewish population at large. 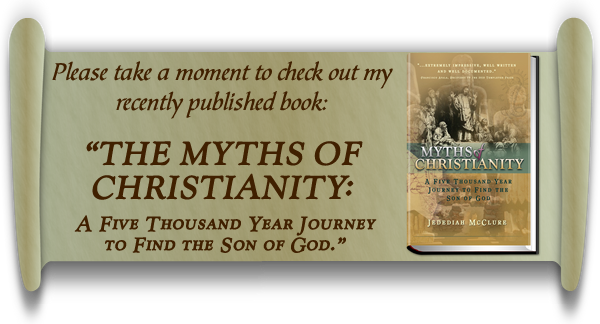 It is revealing that Matthew would make such an effort to address this issue, possibly indicating that it was a critical problem facing the early Christians. In fact, in the last twenty-five verses of Matthew's text, twelve of those verses are dedicated to countering the accusation of body-snatching while only six featured the resurrected Jesus. Clearly, for Matthew, this widely circulated accusation was a significant problem that the author felt he needed to address. 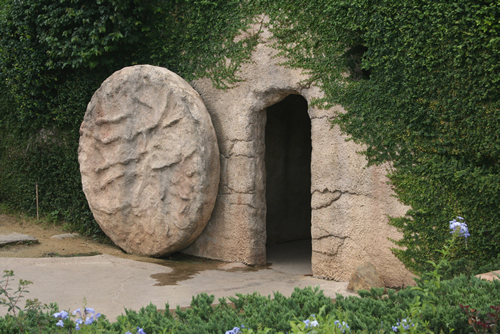 In the end, we may never know what actually happened at Jesus' tomb, but one thing appears certain, even the gospel accounts acknowledge that some people in the first century believed the Resurrection was a hoax.